As it’s getting closer to holiday time my family starts to think about lefse. If you’re not Scandinavian, you might not know what lefse is. For those that don’t know or haven’t heard of this delicacy it’s like a tortilla that is made from potatoes. Most people eat it rolled up with sugar and butter. Some like cinnamon added however and my dad liked it plain with potatoes and gravy. 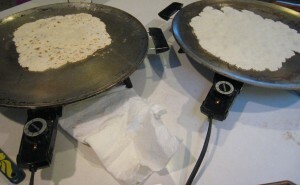 Now lefse is made from mostly potatoes however it does have some flour and butter and cream added. This creates a problem if you have Celiac disease and need to eat gluten-free. My youngest brother is a diabetic and also has Celiac disease so food is a challenge for him. He loves lefse and can eat some sugar if he’s careful so I’m on a mission to make some lefse he can eat. Dale and Jill have been eating gluten-free for 3 or 4 years now and they have much of the diet worked out. They make bread every week, have a list of recipes that work for desserts and have started to eat pizza again and more. There are so many more options for gluten-free diets that it’s becoming easier all the time. We even had adults and children at camp that needed a gluten-free diet so it’s been a part of my life for a while now. I have been searching the internet for people who have successfully made lefse with gluten-free flour. I have found many adaptations of the recipe but there has been not consensus about the best type of flour to use. This lead me to my local store to see what was available. We are fortunate to have several large stores and options in the immediate area. I chose the local grocery type natural food store and they had many options. I ended up with a new flour make by King Arthur Gluten free flour. I know this brand is preferred by many bakers so I decided to take a chance and see how it turns out. I suspect that as long as it tastes remotely like lefse and it stays in one piece that Dale will be a willing subject to try out the end result. I think this might be tomorrow’s adventure. I’ve been having fun with some Huck toweling. I bought a few yards to play with and keep experimenting with options. I’ve done some applique and also added a border to some of the toweling. 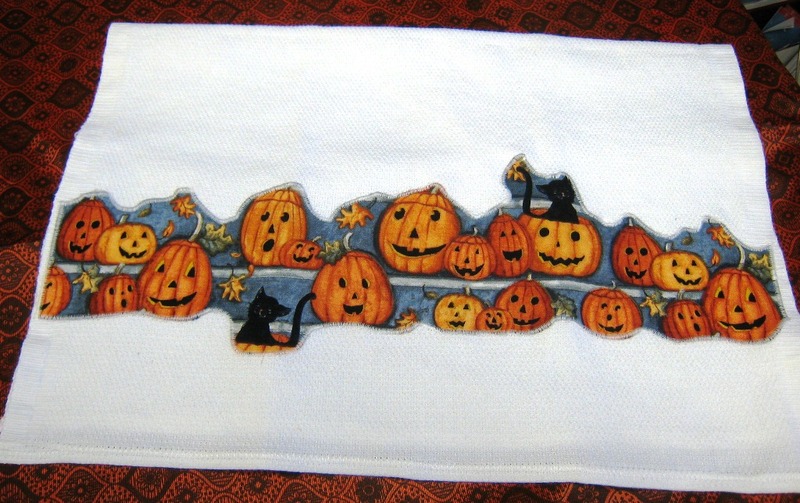 This time instead of a shape applique I added a strip of printed fabric that I attached to the toweling. It was such a cute and colorful print that I thought this might be fun to try. I used wonder under on a large piece of fabric and then used my scissors to cut out what I wanted. I knew that I didn’t want it to be in a straight line so just wiggled around the pumpkins and the scene. I then ironed it on and I used a narrow zig zag stitch to applique it to the towel. It turned out cute. Tomorrow this will go a new home. This friend likes to cook and has young grandchildren so I’m sure they will all find a use for this new dishtowel. On to another project. More Huck toweling ideas to come. Yesterday was shopping day with Mom. Every few months the Macy’s coupons have piled up and it’s time to go shopping. You know how clothes get “closet worn” don’t you? That was my Grandma’s term and Mom has adopted the philosophy. In any case, Macy’s always has some good buys and they have great coupons so off we went. We bought several sweaters, a couple of sweatshirts and a tee-shirt. 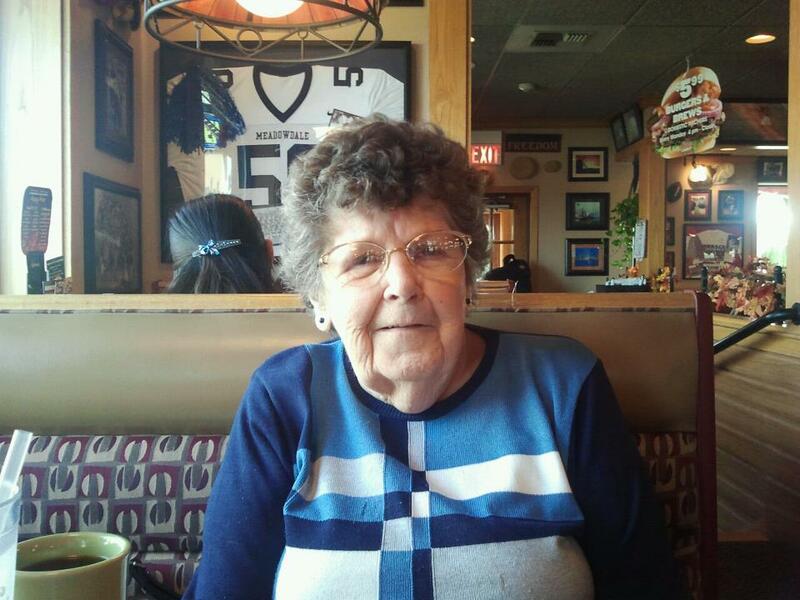 Oh yes, we also bought a birthday gift for Mom’s sister who lives in a nursing home in North Dakota. She doesn’t have any daughters to take her shopping so Mom often sends her new clothes. It was a successful morning and then we went to lunch. The food at the retirement community starts to taste the same after a while so she likes the opportunity to have something different. Yesterday we went to Applebees. Mom had some pork sliders which are the perfect size for her. I took a picture with my new phone and posted it to Facebook. New technology makes this much easier than with the old phone!. I put the picture there thinking it would be nice for all the out of town relatives to see a picture. What surprised me were all the comments on the picture. These included comments about how good she looked to how fortunate I was to be able to have lunch with my Mother. It made me appreciate the opportunity and was a good reminder that yes, I’m lucky that my mother lives close by and is well enough to go out and shop and have lunch. It was a good day. Full of jam that is. 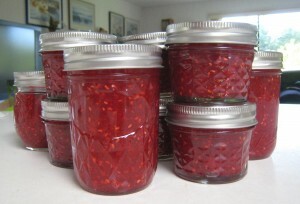 Last night I finally made a batch of raspberry jam. In my humble opinion this is really the only kind of jam that a person needs. I recognize however that if we have some variety it only makes the raspberry jam better. I think this is the third time this season I’ve tried to make raspberry jam. Mysteriously the berries keep disappearing. I do have to admit however that my fingers are always the ones stained with raspberries! No one else here to blame. I did enjoy every bite however. This time I was smart. I bought two half flats and even after I had eaten most of the first I still had berries to make jam. Success! The lucky jars are now residing in the freezer with the jars of strawberry-blueberry and mango jam. I did it and it was fun! Made freezer jam that is. 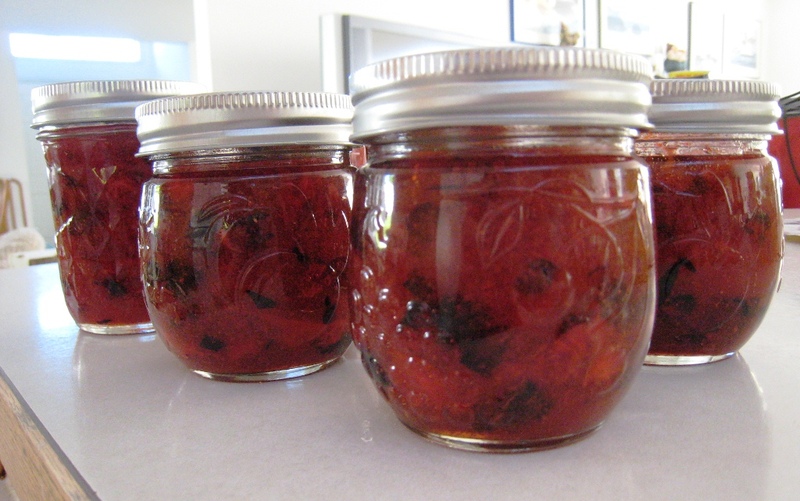 Late on the 4th there was finally time to make one batch of jam. In keeping with the 4th of July theme we had strawberries and blueberries on hand so I decided to make strawberry blueberry jam. It looks great and tastes mighty fine as well. I still have more jars and more fruit so if I can squeeze in a few more minutes today I think I might make a batch of strawberry and also a batch of honey mango. Good eating for several months.